We depend on agriculture for food. Fruits and vegetables are daily necessities for a healthy diet, but what happens when our produce is tainted with toxic pesticides? The National Resources Defense Council (NRDC) has a page dedicated to informing the public about the dangers of pesticides used in conventional farming methods. The NRDC points out that pesticides are poisonous and are a high risk to children. 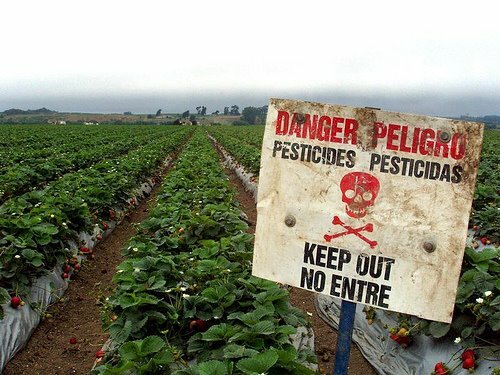 While the EPA does not keep records of reported cases of pesticide poisoning, the state of California does, and from 2000-2008, California recorded 7,600 individual cases of pesticide poisoning. Children are at a higher risk because of their smaller size (they are closer to the ground where pesticides are applied) and because their bodies’ systems are not fully developed and may be negatively altered by pesticide exposure. Organophosphate pesticides can cause a variety of reactions in people from dizziness and confusion to convulsions and even death. They have also been linked to behavioral problems and developmental delays in children. In addition, the NRDC references a 1993 report by the National Academies, which reported that some pesticides can lead to cancer, injury to the nervous system, lung damage, reproductive failure, and dysfunction of the endocrine and immune systems. The bottom line is that pesticides can severely harm the human body in a myriad of ways. Even if you’re not near a farm or breathing in the pesticides routinely as they are applied, pesticides are all over conventionally farmed produce in the grocery store. A post on the Environmental Working Group’s website regarding organic food references this review done by Stanford University researchers. The research indicates that organic produce has fewer pesticide residues – the risk of pesticide exposure is five times higher for conventional produce than organic. To bring meat and dairy into the mix, organic once again prevails over conventionally farmed products. Organic chicken and pork have a lower risk of containing superbugs – bacteria that are resistant to antibiotics. Organic meat and dairy also have more omega-3 fatty acids than their conventional counterparts. The best ways to avoid conventional products soaking in pesticides is to buy organic and to buy locally from farmers who use natural and sustainable practices. EWG publishes a Shopper’s Guide outlining the “Dirty Dozen” and “Clean 15” items in the produce section. Dirty Dozen produce should be purchased organically whenever possible, as the conventionally farmed options had high instances of pesticide contamination. Clean 15 items are the safest 15 conventionally farmed produce items with the lowest instances of pesticide residue. It’s easy to reduce your exposure to these hazardous chemicals – start in your kitchen. About the Author: Caitlin Reed is a freelance writer and blogger based in northeast Ohio. Among other things, Caitlin is passionate about sustainability and is the primary content contributor on The Green Product Site. Feel free to reach her via twitter: @bornagainmin.